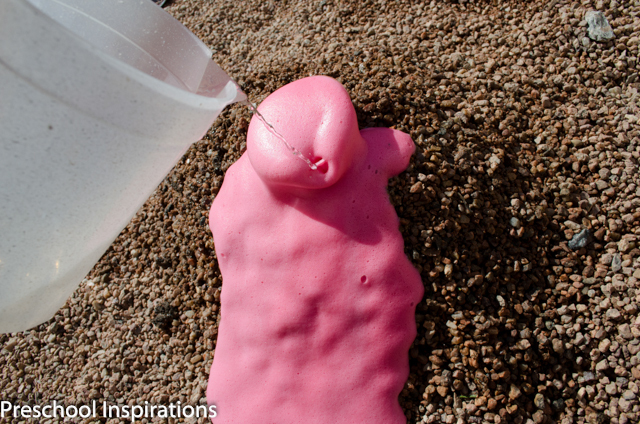 Need a super simple baking soda and vinegar volcano recipe? This one takes about three minutes to prep (and the kids get to help). It uses six common ingredients, and there is no mess to clean up afterward! If simple and no cleaning is music to your ears, you’re in the right place. We’ve made this five times in the past two weeks, so it’s definitely a loved activity here. Want to see it in action? I have an awesome video of it near the bottom of this post! 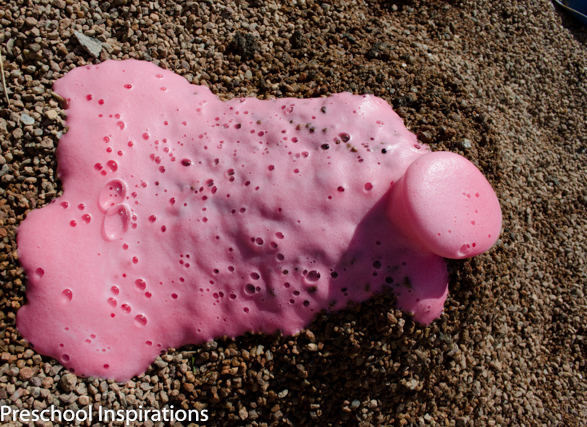 I have always loved making volcanoes with my kids, but they can be time-consuming and require lots of prep. Well, “lots” may be stretching it, but in my world, if it’s not simple, it doesn’t usually happen. The sad truth is that while I’ve thought about making a volcano tons of times, I’ve only made it happen a few. I wanted to change that by making it a super easy process. I hope you absolutely love it! 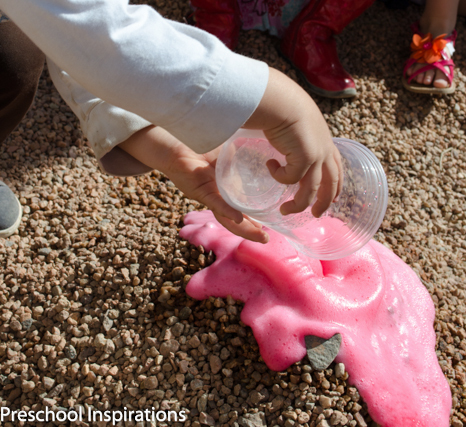 And if you love these types of science experiments, you can see even more baking soda and vinegar experiments that are simple and so fun! They are also an awesome addition to a preschool curriculum. How do you make the easiest volcano recipe in the world? Start off by combining the “base ingredients.” Put the water inside of the plastic cup. Fill it about 2/3 full. Add the baking soda, dish soap, and washable paint . 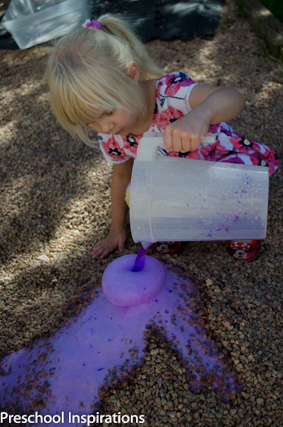 By using washable paint, you don’t have to worry about any staining on the rocks (or little fingers) that food coloring might cause. I tried liquid watercolor as well, but it doesn’t work nearly as well as the washable paint. 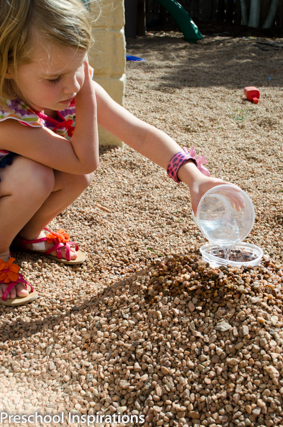 While you mix the base ingredients, have the kiddos make a mound out of pea gravel (or you could certainly do this with dirt). Once you have a mound, put the cup on top of it, and turn it into a mountain. How easy is that! We give it a good stir just before adding the last ingredient. Now it’s time for the eruption! Pour in the vinegar until it starts foaming over, pouring it’s lava all over the rocks. 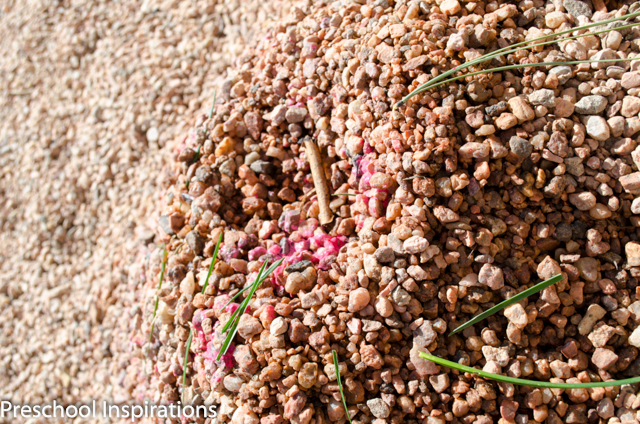 The pictures really don’t do this justice, but our pea gravel mountain was just under a foot tall (30 cm). It is also super fun to mix up the colors a little bit! We can pour the vinegar in about three times before we need to add more baking soda to our solution. Want to see it in action? Here’s the video! Since we can’t get enough of this, here are some more snapshots of our other volcano eruptions. What does it look like afterward? Here’s a picture of ours once we took away the plastic cup. 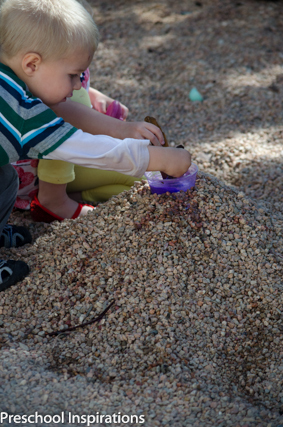 You can hardly even tell we did anything, and the rocks must be nice and clean with the baking soda and vinegar. 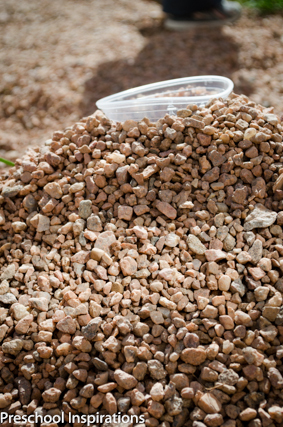 If the washable paint doesn’t come off the rocks right away, it will within a few days or the next rain. 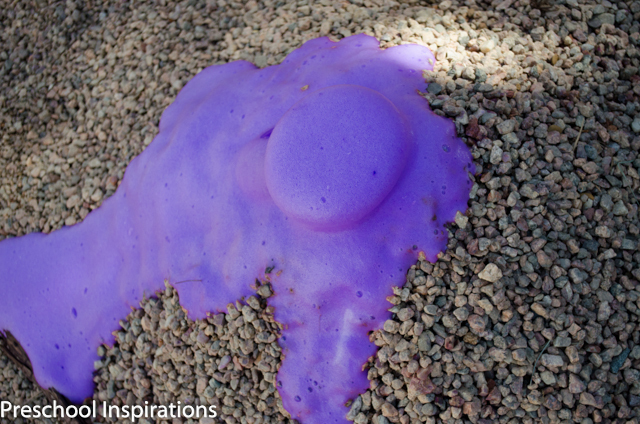 If you want to see what this looks like with dirt, check out these fun volcano posts! 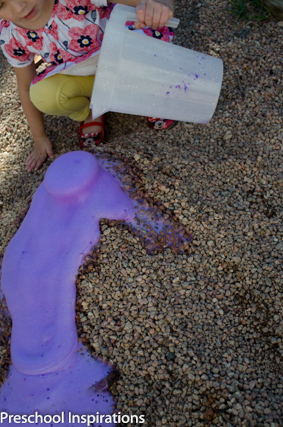 Messy Play Fun with Shaving Cream from Fun-A-Day! Can you do this without the paint too? Hi Amanda, it works without paint. It just won’t be colored. Have fun!